The house dims, the curtain opens and the stage lights come up; revealed at the back of the bare stage is an older man in white dinner jacket that shines brightly in the stage lighting. He is the Stage Manager. Beside him stands his assistant, an elegant woman dressed in a black tux. The black high heels she wears accent her height. They complement each other. “This play is Our Town. It was written by Thornton Wilder. The Stage Manager continues: he tells us about the churches, the town hall and post office combined in a single building where William Jennings Byran once gave a speech. He mentions, matter-of-factly, the side-by-side homes of Dr. Gibbs and editor Webb where Emily and George live. While he speaks, his beautiful assistant points out to us each building in the imaginary landscape of theater with elegant motions of her outstretched hand. I’m distracted. I can’t decide: does she look like Marlene Dietrich in Morocco or the EmCee in Cabaret? This is an unusual opening for America’s most often produced play. Usually, as the audience enters the theater they are greeted by a bare stage. Or, if they are late, they will see the Stage Manager arranging a chair or two; he may greet the latecomers with “How ya’all doin’ tonight; traffic bad?” Wouldn’t that be fun to watch? This Stage Manager does not have the folksy, down home attitude that Thornton Wilder used when reading from Act I to the entertainment of President Kennedy’s Cabinet in 1962 nor is he like Hal Holbrook in the 1977 TV version of Our Town. This opening is also totally different from that of the Rogue Theater in NY, where the play was recently presented for the longest run ever—over a year. The play has scarcely started and the audience has been treated to several departures from the usual professional or Sam French licensed amateur production. What is going on here? Maybe I should reread the program. A quick read of the program confirms my suspicion— French director Georges Lavaudant and Stanford French professor Jean-Marie Apostolidès have staged a new production of Our Town as part of a France/Stanford cultural exchange. The play has been recast from a three-act play to a one-act play with three scenes and the time reduced from roughly 2 hours to 90 minutes. “You are attending an unorthodox staging of the play [Our Town]. Not only have we deconstructed the text but also we have chosen to detach it from its specific historical context. This perspective aims at achieving two different goals. The first is pedagogical. Understanding those paragraphs while waiting for a play to start was more than I could handle, and the tone upset me in a vague way that is hard to describe. Who do GL & JMA think they are, anyway? Moreover, the directors’ threat of deconstructing this Pulitzer Prize winning American treasure is disconcerting to me. What is “deconstruction” anyway? Well, I hope that makes everything really clear. “[Thornton] Wilder was the author of Our Town, a popular play (and later film) set in fictional Grover’s Corners, New Hampshire. It was inspired by his friend Gertrude Stein’s novel ‘The Making of Americans’, and many elements of Stein’s deconstructive style can be found throughout the work. Maybe I’m digging myself into a hole here. Let me just say that the French directors are staging an “innovative” performance of this American classic and be done with it. It’s a pretty simple outline, as plays go, not much there to deconstruct. Back in Pigott Theater: there are many other innovations. The second scene curtain opens to a large dining table that is almost the width of the stage. It is set with wine glasses filled with red liquid that glows in the stage lighting. I don’t understand the significance of this table or how it enhances the story. It seemed to get in the way of the actors and made the staging of the courtship and marriage of George and Emily somewhat awkward. It was in this act that I noticed that two actors were playing the part of Emily—they alternated lines with George turning from one to the other. He didn’t look confused, but I sure was. How strange. This is a bizarre effect that shifts focus from George and Emily to the artificiality of the theater. Come to think of it, in the 1940 film adaptation staring William Holden as George and Martha Scott as Emily, when the dead Emily returns to life to relive her 12th birthday the dead adult Emily and the live 12-year-old Emily are separate images. It was a Hollywood touch that looked strange and detracted from an otherwise excellent movie. My readers’ edition of Our Town is the 2003 reissue of the 1939 hardcover edition. There is an excellent Foreword by Donald Margulies and an extensive Afterword by Tappan Wilder, who is Thornton Wilder’s nephew and literary executor, and the manager of his literary and dramatic properties. This is a very readable edition of the play because of the detailed stage directions and the simple plot. Coming back to the Stanford production of Our Town, the audience was quiet and attentive and seemed to be having a good time. The applause at the curtain call was long, loud and genuine—I think the audience was satisfied and liked the production. I enjoyed the play, once I got over my initial shock. “Good-by, Good-by, world. Good-by, Grover’s Corners”… Mama and Papa. Good-by to clocks ticking … and Mama’s sunflowers. And food and coffee. And new-ironed dresses and hot baths … and sleeping and waking up. Oh, earth, you’re too wonderful for anybody to realize you. Usually, eyes get teary when these famous lines hit home, but I didn’t feel that emotion in this production. Too bad, but there are memories of previous productions. For an unforgettable viewing experience check out the 2003 documentary OT: Our Town, which is the story of a Dominguez High School production of Wilder’s Our Town in Compton, California. The high school is known for basketball, but not theater. The students put on the first school play in 20 years. The movie is available on NetFlix. 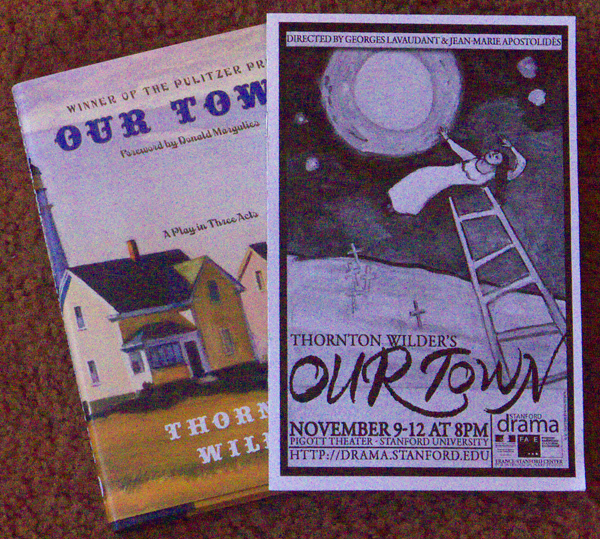 Day 82: Our Town, Thornton Wilder (2003). This entry was posted in Classics, Theater and tagged American Literature, Our Town, postaweek2011, Stanford, Thornton Wilder. Bookmark the permalink. I enjoyed your review of this production. Although I hadn’t seen it, I got a good feel for what was presented. I think you were respectful of the company, yet faithful to your own response to their choices. Nicely done. This is such a well written and documented review. I’m glad I was directed to it. I am, however, distressed that you were so disoriented and disappointed by the need of modern producers to “do something different”, and in this case to “deconstruct” the play. There seems to be a need in modern society to “get to the bottom” of emotion and “what is hidden” behind well known words. We are psychologically directed into our reactions, instead of being allowed to respond in our own personal way to what is presented. 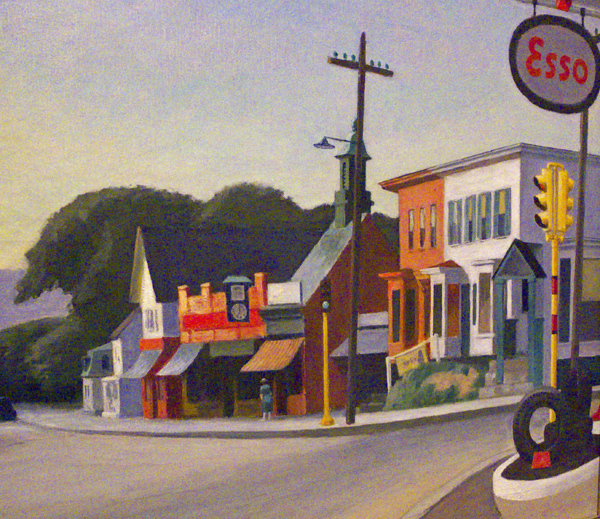 As you point out in a variety of ways, Our Town has stood the test of time as it was written. I have to agree with this comment. If University productions don’t try to take new approaches to drama, who will?